La Cattedra UNESCO 'Diritti umani, democrazia e pace' e il Centro di Ateneo per i diritti umani dell'Università di Padova si associano all'unanime cordoglio per il decesso di Marc Nerfin, Presidente della International Foundation for Development Alternatives, Ifda (Nyon, Svizzera), grande costruttore di pace e assertore di un ordine mondiale più giusto e pacifico fondato sul diritto universale dei diritti della persona e dei popoli e sulla centralità di una ONU più forte e democratica, capace di realizzare sviluppo umano e garantire sicurezza umana. Marc Nerfin aveva partecipato nel maggio del 1988 al Convegno di studio organizzato a Padova dal Centro Diritti Umani in occasione del 40° anniversario della Dichiarazione Universale dei Diritti Umani. 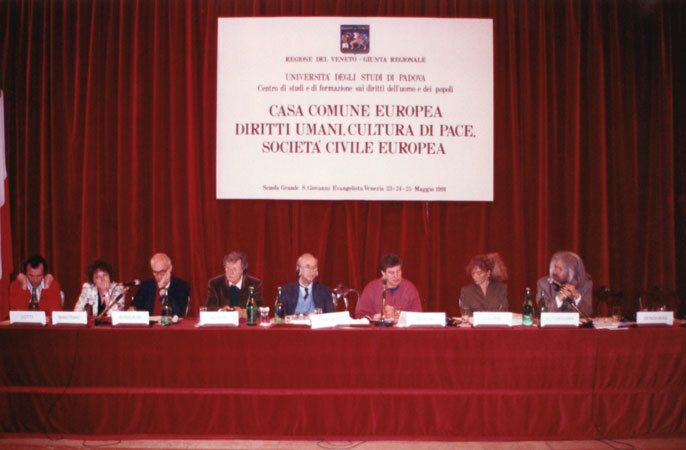 Nel maggio del 1991 Marc Nerfin tornò a Padova/Venezia, sempre su invito del Centro, per partecipare alla Conferenza internazionale "Casa comune europea, diritti umani, cultura di pace, società civile europea" promossa insieme con la Helsinki Citizens Assembly quale contributo ai primi sforzi di aggregazione delle formazioni di società civile dei paesi dell’Europa centrale e orientale e di incontro con l’associazionismo dell’Europa democratica (nella foto di questa news, relativa a tale Conferenza, Nerfin è il quarto da sinistra). Marc Nerfin, a former Vice-President of IPS, passed away peacefully at his home in Paris on 15 August 2015, cared for with devotion by his beloved wife, Joy Assefa. Marc was a thinker and activist in international development dialogue, always on the side of those seeking a just, equitable and sustainable world order. He played a key role in Sir Robert Jackson's ‘Study of the Capacity of the United Nations Development System’ (1969) and in the secretariat of the United Nations Conference on the Human Environment, led by Maurice F. Strong (1971-1972). He contributed to the alternative concepts of development, beyond growth and integrating social and environmental dimensions that were shaped by symposia held in Founex, Switzerland (1971) and Cocoyóc, Mexico (1974) and disseminated in What Now? Another Development (1975) - a project that he led for the Dag Hammarskjöld Foundation. Those were the roots of what later emerged as “sustainable development”. In 1976, evolving into the role of institution builder, he established the International Foundation for Development Alternatives (IFDA) in Nyon, Switzerland, a network of progressive thinkers and home of the ‘IFDA Dossier’ – an open forum for ideas about development that was published from 1978 to 1991. Marc’s own thinking on the mobilisation of civil society in national and international governance was presented in ‘Neither Prince, nor Merchant: Citizen’, IFDA Dossier, Nov/Dec 1986. As President of IFDA and as Vice-President of IPS, Marc provided practical support for 'alternative information for another development'. This was in pursuance of the What Now? report that identified improved public information about development as one of ten action points. In cooperation with the IPS news service, IFDA began publishing the ‘Special United Nations Service’ (SUNS) as a daily news bulletin from the time of the 11th Special Session of the U.N. General Assembly on the New International Economic Order (25 August - 15 September 1980). Marc was also involved, behind the scenes, in the 1987 establishment of the South Commission, chaired by Mwalimu Julius Nyerere and led by Manmohan Singh. Marc Nerfin was a man of conviction who earned the respect of all who met him. Those who knew Marc personally will treasure the memory of a wise, loyal and caring friend. He will be laid to rest in his home village of Founex, Switzerland.